I am fortunate to live in the midst of New England woods and fields and many of my current works are based on my nature-theme photos. I like to start my art with strong photographic images. In some cases like this one the photo itself neither needs nor wants enhancement. A path leads into the woods across the country road from our home in Wayland. After a twisty mile or so of thick woods, the path opens to a wide meadow. Then you can follow a dirt road to a horse farmer’s pasture, pass farm houses, and cross another broad meadow into the darkness of the woods again. A jewel of a pond separates the fields and the woods, one of my favorite subjects. 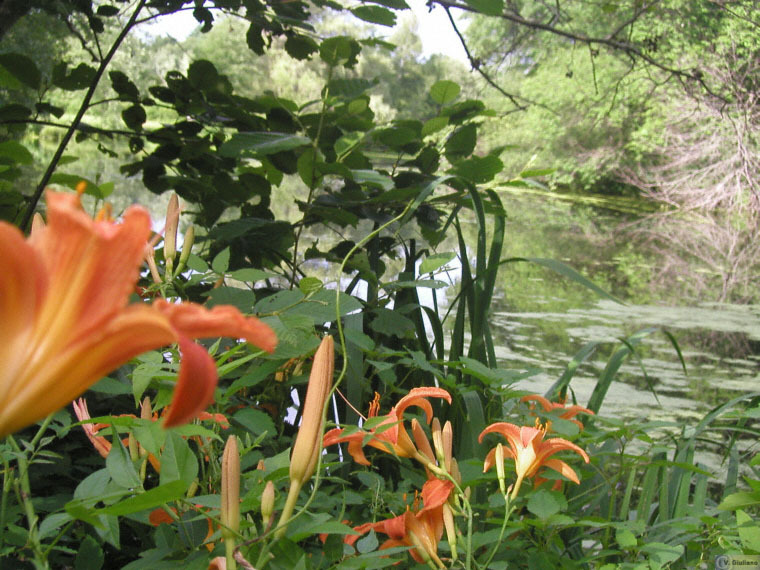 The close day lilies and far water and woods jumbled together gives the feel of the narrow path through the woods along the pond side.